284 in stock Need More ? 'I have stolen princesses back from sleeping barrow kings. I burned down the town of Trebon. I have spent the night with Felurian and left with both my sanity and my life. I was expelled from the University at a younger age than most people are allowed in. I tread paths by moonlight that others fear to speak of during day. I have talked to Gods, loved women, and written songs that make the minstrels weep.My name is Kvothe.You may have heard of me'So begins the tale of Kvothe - currently known as Kote, the unassuming innkeepter - from his childhood in a troupe of traveling players, through his years spent as a near-feral orphan in a crime-riddled city, to his daringly brazen yet successful bid to enter a difficult and dangerous school of magic. 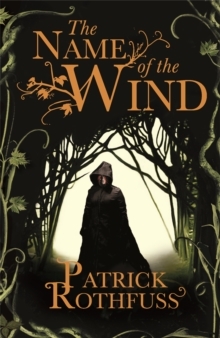 In these pages you will come to know Kvothe the notorious magician, the accomplished thief, the masterful musician, the dragon-slayer, the legend-hunter, the lover, the thief and the infamous assassin.The Name of the Wind is fantasy at its very best, and an astounding must-read title.